Does this professional gaming laser mouse stand out from the crowd? One of the first things you notice when you begin using the QPAD 5K LE professional gaming laser mouse is its size. Its width and length are both larger than most mice, which means it takes a bit of getting used to if you've been using a smaller mouse. Still, it's far from gigantic, and feels pretty comfortable to use. 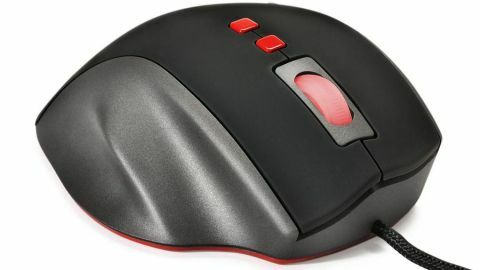 Alongside the usual left and right mouse buttons are two buttons on the face of the mouse, and two buttons on the side. The two buttons on the face switch between two speeds, which is handy for quickly altering the mouse's precision when playing games. Two LEDs to the side of these buttons inform you of which speed you've selected. It's nice to be able to switch speeds on the fly, but other gaming mice enable you to choose between more than two speeds. The two buttons on the side of the mouse by default are forward and back commands. They are raised slightly higher than on other mice, which helps to minimise accidental presses, which can be extremely annoying. Software for customising the buttons, as well as the two speeds you can switch between, can be downloaded from QPAD's website. The QPAD 5K LE professional gaming laser mouse is easy to use, making this a versatile gaming mouse that's responsive, feels good and is easily customisable.